http://thehill.com/blogs/blog-briefing-room/news/316355-obama-set-for-vacation-at-76m-estate-after-press-conference [and from another] Biden cancels his annual summer party for Journalists on June 3, 2013. http://townhall.com/tipsheet/katiepavlich/2013/06/03/party-pooper-joe-biden-cancels-summer-party-for-journalists-n1612075 Then Obama cancels his annual summer pool party for Congress, hoping to reschedule to September. http://www.thedailybeast.com/cheat-sheets/2013/06/11/cheat-sheet.html#7 [and from another] Obama is not traveling outside the US! Sending others to do so. "Republican Sens. Lindsey Graham and John McCain say they're traveling to Egypt next week at President Obama's request, in hopes of spurring the reconciliation process there." "President Obama is meeting Tuesday morning with the lead Israeli and Palestinian negotiators who began talks in Washington." "Former President Jimmy Carter's reported travels to North Korea aren't in cooperation with the Obama administration and would be a "private trip," the White House said Monday, following reports that he was headed there to negotiate for the release of a U.S. citizen." Numerous examples, but they come to the White House. Obama does not leave the country. [and from another] G20 meets in September 5-6 in St. Petersburg. China has Mid-Autumn holiday from Sep 19-21, and big National Day thingie from Oct 1-7. Russia is clear until Nov 4, their Unity Day holiday. USA has labor Day Sept 2 then clear to Holloween October 31. Late August is clear for all. Interest in the pending announcement admitting the presence of Planet X, aka Nibiru in the inner solar systems is intense. When will it be done? How will it be framed? How closely will it align with the facts of its arrival in 2003 and the halted Earth orbit? Will a virtual admission of the presence of aliens visiting Earth occur, simultaneously? Last May, 2013 we reminded the public of the many attempts Obama made in the Fall of 2012, all of which were blocked by the cover-up crowd who did not allow the EAS system or a broadcast from the Oval Office to occur. Obama then began a campaign to identify and incapacitate those in the federal government who were thwarting him on the announcement, and over many months notables like General Petraeus, General Allen, and the second in command at the CIA, Michael Morell were dismissed. Imagine the fallout in lesser positions. Meanwhile numerous assassination attempts were made. Diesel was put into Obama’s car in Israel, to force a roadside transfer open to a sniper. Poisoned tableware at a Republican luncheon was attempted. A fire in the West Wing of the White House. A Santa Monica shooting rampage as a diversion during Obama’s visit. And these are only the attempts known to the public. Meanwhile, Obama and his team developed a failsafe plan. As we explained on June 15, 2013 this would involve other countries, all announcing simultaneously. Russia and China are the main players, but dozens of countries would be involved. Even if Obama goes missing and even if he is reported by others or a lookalike to have changed his mind, the other major players will proceed. That is the agreement. Nancy noted in her newsletter on late July 28, 2013 that a number of Chinese Ltd investment companies, newly formed, were attempting to secure domain rights via Chinese registrars based on the ZetaTalk name. This occurred just days before Premiere Xi’s meeting with Obama in Santa Monica. Something was to happen to make ZetaTalk very popular! As we stated in June, the date had been set, frozen, so the aggressive cover-up crowd in the US could no longer control the outcome. Meanwhile, the date was closely guarded to reduce interference, remote viewers blocked from extracting the date. Even Nancy is unaware of the date so she cannot inadvertently give it away. Minor players, smaller countries, will be informed just prior to the date, to minimize leaks. This of course does not stop speculation. Nancy researched holidays and government functions in China, Russia and the US. It was noted that both Biden and Obama canceled traditional Summer parties for jounalists and legislators and reset the dates potentially in September. Obama was no longer traveling overseas, sending envoys instead, but was due at the G20 in Moscow in early September. August looked ideal. Meanwhile it is no secret that self-promoters are trying to position for the stage at the last minute. But it is not the Internet conspiracy crowd that will determine what the major networks do. It will be regular daytime radio shows and TV stations that will dominate. Given the certain mention of Nancy’s name during the coming announcement, that will be the guide as to what direction the microphones are pointed. Could the Zetas say something about this latest crop circle http://www.cropcircleconnector.com/2013/monumenthill/monumenthill2013a.html [and from another] Note that the trimester change for one of the trimesters is emphasized. Which one? In that the Zetas have given the dates of the trimesters as August 12, December 17 and then April 20, it would seem that there is a slightly shorter time between April and August (114 days ) and a slightly longer time between August and December (127 days more) with the last trimester to April 20 close behind (124 days). The spacing on the 12 month edging of the Monument Hill crop circle thus seems to indicate this crop circle is pointing to the August trimester change. Is this giving us a heads up? This design is legitimate, as shown by the weaving of grain. It is also an obvious reference to the Magnetic Trimesters due to room for 12 evenly spaced scallops along the periphery of the circle and 3 points touching this periphery from the center. The trimesters, shown by what look like squashed rectangles, are not identical, as the touch points along the periphery are not even. The trimester dates have been given as August 12, December 17, and April 20. Thus it is clear that the August 12 trimester change is being emphasized in this design, and of course being laid on August 6 this is close in time to the August trimester change. The Magnetic Trimesters cause an adjustment in the Earth, and as with all such adjustments there are consequences. Major earthquakes tend to occur clustered around a trimester change. A trimester change will tend to exacerbate any magnetic instability the Earth might be experiencing, as a trimester change is by nature a magnetic influence. 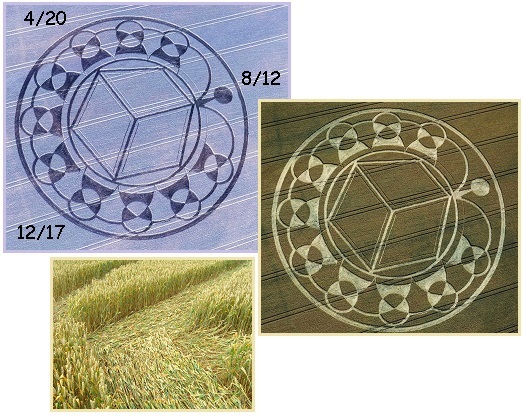 This crop circle is an explanation of the Magnetic Trimesters, and also a warning. This is a FM radio frequency assigned to the internet as well as local radio stations, and currently used in that capacity in N America and Australia. Why would NASA suddenly decide to have a presence there? The announcement will bring about many changes, one of which will be an almost constant stream of pertinent questions directed at NASA. Should they hold a perpetual press conference? NASA will promise, during the announcement, to keep the public informed of changes. After every earthquake or atmospheric display, there will be anxious questions. This will be an avenue to replay the last update, periodically, to the anxious public.